10-Jan-2012 -- This is the fifth out of ten confluences that we visited during our trip to Argentina, Chile and Uruguay. The story begins at 35°S 59°W. The previous confluence visit is 51°S 71°W. We had quite a late start at 9:30 AM in the town Puerto Natales which is located about 50 km north-east of the confluence point. Visiting this confluence point is so straightforward that the routing according Google Maps simply reads “continue straight onto Ruta 9”. Indeed, a successful visit does not even require leaving the car. You can park conveniently at the entrance to the Estancia Berta in 99 m distance. We did so and Elionora opted to stay in the car because the visit was considered as “complete” anyways. In contrast to Elionora, I wanted to find all zeros and therefore went outside the car into the strong blowing wind. The exact point is on grassland, but it is obvious that the area has formerly been a forest. Several rotten tree trunks are lying around on the meadow. Within 100 m radius there are some real forests, but also fences, the main road no. 9 and overhead power lines. In order to reach the exact location of the confluence point, a fence needs to be climbed. I opted to crawl under, but thereby caught more than 200 limpets that stuck on my jacket. 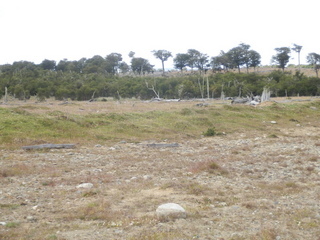 Description of the CP: In southern Chile, 3 km from the border to Argentina. On a private, fenced compound with mainly grassland. Story continues at 53°S 72°W.